The Long Road Home For A Cuban Baseball Legend Luis Tiant left Cuba in 1961 to play pro baseball in the U.S. In 2007, at the age of 67, he made a bittersweet return to his homeland. Filmmaker Jonathan Hock, who documented the trip in The Lost Son of Havana, talks with Robert Siegel. Jonathan Hock went to Cuba to film the return of one of Cuba's most famous native sons. 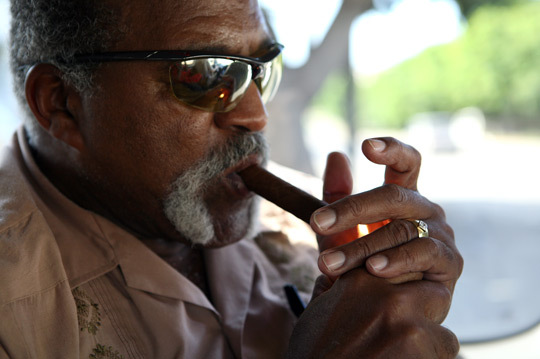 Retired Cuban pitcher Luis Tiant stops for a cigar during the filming of the documentary The Lost Son of Havana. The new documentary The Lost Son of Havana tells the story of baseball legend Luis Tiant and his return to Cuba after 46 years. Tiant was an old man, long retired from baseball, when he finally returned to his native country. Filmmaker Jonathan Hock came with him on the trip. "He had an extraordinary need to see his family and find out if it was OK with them that he'd never come home, knowing how much they had suffered in the 46 years that he had been gone," Hock tells NPR's Robert Siegel. Tiant had been pitching for the Mexican baseball league during the Bay of Pigs invasion. He had recently married and was planning to go back to Cuba for his honeymoon. 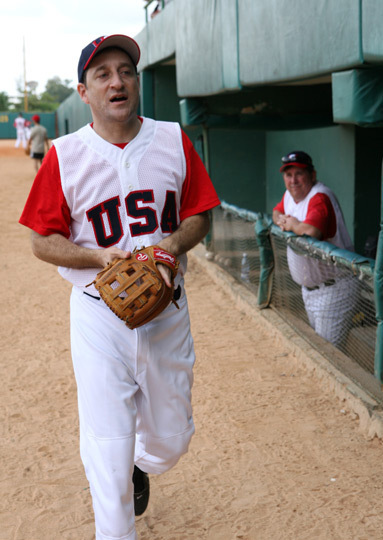 But his father sent him a letter saying "don't come home," explaining that there was no longer professional baseball in Cuba and that the new communist government under Fidel Castro wasn't letting anyone leave the island, Hock says. Tiant's father told him to "give it a little time, it'll blow over and come home for your honeymoon then," Hock says. Tiant stayed in Mexico and then went on to huge success in Major League Baseball in the United States. He pitched for several teams in his 18-year career, most notably the Boston Red Sox. "None of them expected that it would be 46 years before Luis went home," Hock says. Tiant and his parents were reunited in the United States, but the rest of his family stayed in Cuba. Hock says it would have been easy for Tiant to settle into life as a retired New England baseball legend, going to Fenway Park every once in a while. But Cuba pulled at him, especially the family members he had left behind. "He needed to settle his score back home before he checked out," Hock says. The first person Tiant met in Cuba was Juan Carlos Oliva, the brother of Tony Oliva, another baseball player who had left Cuba for fame and fortune in the United States. Juan Carlos Oliva broke down in tears when talking about his brother leaving the family. "It had broken the family's heart," Hock says. But Oliva's family also rejoiced at Tony's success. Hock says meeting Oliva's brother and seeing his family's pain and joy prepared Tiant to meet his own family. The film includes a touching but sobering scene at a party where Tiant meets some of his extended family. He is rich and they are poor. They soon ask him for help — in cash. "This was one of the most uncomfortable scenes I've ever filmed. But you have to shut off your emotions and keep the camera rolling," Hock says. As Tiant is getting ready to go, his cousin takes him aside and explains that life isn't easy, they are living on cigarettes and they need more money than the government gives them. Tiant reaches into his pocket and gives her all the Cuban money he has. Some of Hock's filmmaker friends who looked at the rough cut of the film said he should take the scene out because it was difficult to watch. 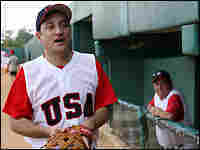 But Hock decided to keep it in: "This Cuban-American thing is very complicated. I don't think Luis was ashamed to do it; I don't think his cousin was ashamed to ask." The moment illustrates the central tension of the story: by leaving Cuba and his family, Tiant found huge success. His family did not. "He's been running from it his whole life," Hock says. Returning to Cuba brings Tiant a measure of peace. "I feel better," he says in the film. "My heart is better; my head is better. I guess I can close my book now. If I die, I die happy." Lost Son of Havana premieres Thursday at the Tribeca Film Festival in New York City. Watch a clip from "The Lost Son of Havana."